To accomplish the science goals of Atom, every scientific instrument on the NASA DC8 is tenderly cared for. In the case of the Single Particle Soot Photometer (SP2) an instrument for quantifying black carbon aerosol concentration, this care includes gentle heating after cold nights, frequent laser intensity calibrations, and renewal of drying agents used to produce conditioned air to keep laser components clean. However, as in those occasions in which the instruments fail in one way or another, the most important component is not mechanical or electrical, but rather biological; the caretakers themselves need some coddling to ensure that they (we… I!) can think clearly and effectively when “push comes to shove”. During the Atom flights from Christchurch, NZ to Punta Arenas, Chile, and from Chile to Ascension Island, we traveled over 12 time zones in short order; long, warm showers and extra naps seemed to be the popular prescriptions to deal with this stress. I highly recommend more regular maintenance during flights, in the form of carefully thought out meals. These provide not only calories, but also a welcome break from the potential monotony of the ATom flights; for black carbon, most of the excitement lies not in the second-to-second observation of the data stream, but rather in the global-scale trends in concentrations that we can extract from the measurements only after carefully quality controlling and analyzing the data. Many on the DC8 simply buy a fast-food sandwich before each flight (if departure times allow), and eat at their seats. I prefer to use the whole of the aircraft as kitchen and dining parlor. 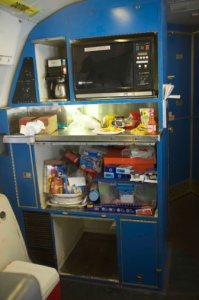 Let’s take a look at the facilities: the DC8 is equipped with a coffee machine (with hot water tap) ,a microwave (so old! ), a hodgepodge of communal condiments and utensils, and a cooler stocked with water. Figures below: left, the mess. 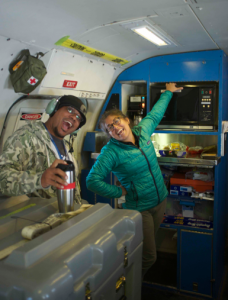 Right, the mess in action: Matt Berry (Mission Director) and Stacy Hughes (Whole-air sampling princess), bringing life to the rear cabin. Stacy is testing a new application of the microwave: to warm her hands because the flight was brutally cold. I think she was heating a New Zealand meat pie as her meal. 3) if everyone else on the plane jealous, that ain’t bad. The first is fairly easy to achieve: quantity, quantity, quantity. All you need is plenty of candy. Now, flying to Ascension Island, I have a Chilean-version Kit Kat, Nutty Bars (a terrific ace in the hole, which I stocked up on in the US before the mission began), NZ potato chips, apples, prunes (yum! ), Crunchie bars, Crispy Rolls (from Chile, these appear to be chocolate-covered corn flakes), Sabor frambuesa batido (raspberry yogurt from Chile), a bag of pimiento olives, and a “sahne-nuss” chocolate nut bar, hummus, and carrots. These are stashed on the floor between the SP2 rack and the wall, where a chilly breeze keeps everything refrigerated. Of course sweet drinks (hot chocolate and chocolate milk rate high, orange juice is a refined alternative, regional specialties are always worth trying (except for “L &P”, the exception to the rule, popular in New Zealand, but probably inspired by a marriage of Pinesol and simple syrup. Ugh!). This could be a little light for today’s 9 ½ hour trek, but extra treats from the rest of the ensemble can usually be begged. And one can always hope for unexpected treats – on the last flight Jim Elkins (NOAA) passed out macademia nuts; I remember a different mission where we celebrated crossing the equator with cookies. The scale to a achieve a meisterwerk slides depending on many factors: the availability of foodstuffs at the departure airport (I remember leaving Easter Island with only ramen noodles); the quality of the rest of the crew’s meals (competition is growing more fierce); flight conditions (turbulence quickly narrows the range of possibilities – soups are OUT! ); and one’s own standards for a fine dining experience. My standards are happily very low in this regard. On the flight out of New Zealand, my magnum opus was nachos made with NZ tortilla chips (yellow corn, meh), hand cut cheese in the microwave (Colby, quite good), topped with Frank’s Original Hot sauce (one of my contributions to the kitty), and adorned with pureed avocado (the fresh avos in Christchurch were all rock hard). In the old days, simply bringing a frozen indian meal (I’m a tikka masala man) was sufficient to set the bar. I do have plans to perfume a pig, and hope to extend a ramen soup with a fresh egg, cheese, and sesame oil. I considered making ceviche, but decided against the risking a fishy-smelling cabin for the rest of the mission. To ensure that your meal is appropriately obvious to the others on the plane, I recommend a highly scented hot meal marched up and down the aisle as you eat. 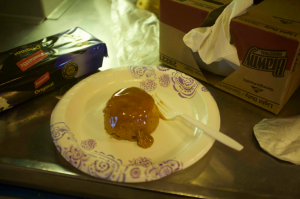 On the NZ flight, I used a “hot scotch toffee cake” to spread a warm glow of sweetness through the cabin (photo below). Leadership by example, I say! Let’s not let these hard-thinking scientists forget to keep every tool in their chest oiled and ready for use in the service of science, society, and high altitude gastronomy.